May's huddles with German Chancellor Angela Merkel in Berlin and French President Emmanuel Macron in Paris come on the eve of another tension-packed summit in Brussels focused on the fate of the 46-year-old partnership. 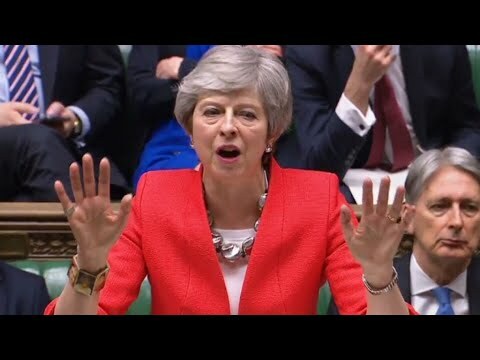 May asked EU leaders on Friday to delay Brexit until June 30 to give her time to strike a compromise with the opposition that lets Britain's hung parliament back an orderly divorce plan on the fourth attempt. But the 27 European leaders have already signed off on one extension -- the original deadline was March 29 -- and have serious doubts that May will somehow break through the political gridlock now. May's predicament is complicated by growing EU fears that the chaos will soon carry political and economic costs even heavier than those potentially incurred in case of a messy "no-deal Brexit". This view is being promoted publicly by Macron and is also believed to be backed by Belgium and Spain. "We'd need a strong political reason to delay," a diplomat from this camp said. EU Council president Donald Tusk's office last week floated a compromise proposal that gives Britain a "flexible" extension of up to a year -- which ends earlier should some way forward emerge in London. France is not opposed to an extension to the Brexit deadline, but would push for strict conditions to be attached, adding that a year would be “too long”, an aide to French President Emmanuel Macron said Tuesday. "We've never been closed to the idea of finding an alternative solution to 'no deal' within certain limits and not at any price," the aide said on condition of anonymity, a day ahead of an emergency summit of EU leaders where Britain will press for a further extension. Merkel takes a more conciliatory approach backed by EU member Ireland -- a crucial player whose politically sensitive border with Britain's Northern Ireland is holding up May's deal in parliament.